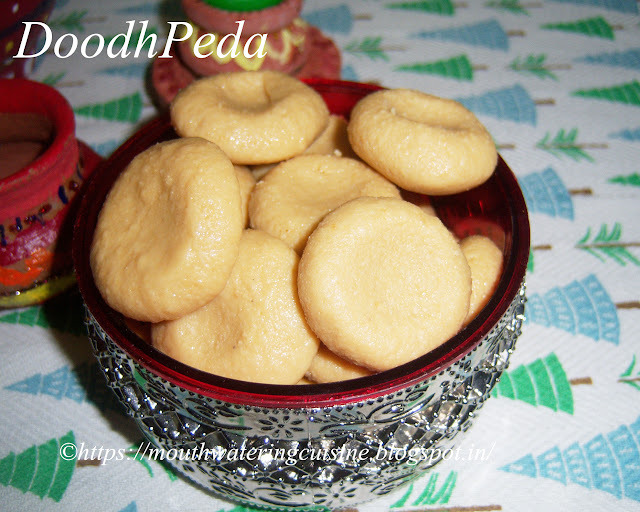 Doodh Peda or Milk Peda or Palakova is a very famous Indian sweet. 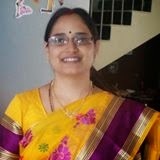 My mother is expert in making this sweet, as my dad offer this to Lord Saibaba on every Thursday. Some times she makes them as small roundels or some times she spreads it on a plate and cut them into small pieces. I am very fond of this sweet and I only consume the most of it. She used to make it with both full fat milk and also with 3% fat milk that is milk with lesser fat. Both are very tasty and smooth. She gave me all the tips and tricks she follows while making it. It takes longer time to make it. We need to have lot of patience, as we have to stir continuously. In a thick bottomed vessel add little water and pour milk. Bring it to boil. Add a small spoon to it, so that milk won't stick to the bottom. Stir it continuously and scrape the edges to combine the cream formed. Once milk reduces to half, add sugar and stir well. Once sugar melts completely add curd. After 5 minutes milk starts curdling. Let it boil till the whey also evaporates completely, stirring continuously. Allow this to cool and add cardamom powder. Knead it with hand or grind it to make smooth dough. Take a small portion of it and shape it between the palms. We can make round shaped or flatten it with fingers and thumb it in the centre. Allow them to dry for half an hour and store them in an airtight container. In a thick bottomed kadai, add 1/2 cup of water and pour 1 and 1/2 litre milk. Adding water even before adding milk in the vessel, prevents the milk to burn from bottom. Allow this to boil, while stirring ocassionally bring this to rolling boil. Once the milk reduced to one fourth of the quantity, add sugar and stir continuously. When sugar melts completly, add curd to it. The milk starts curdling, after 5 minutes of boiling. Do not leave the milk, stir continuously. While stirring continuously allow the whey in the milk to evaporate completley. Remove from flame and allow this to cool. Once cooled completely, grind it or we can knead it with our hands and make a smooth dough. Grease hands with little ghee and make a lemon sized round peda or slightly with fingers and flatten and press in the centre. Serve this doodh peda any time.